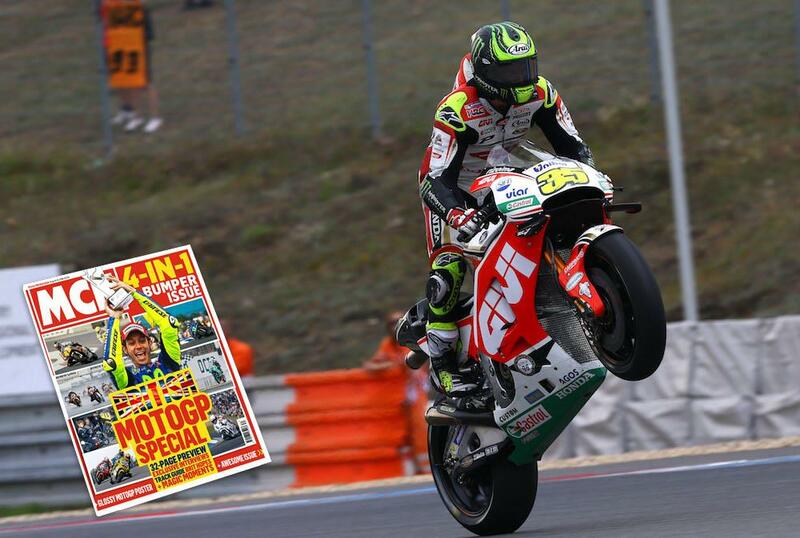 Cal Crutchlow sensationally brought an end to the agonising 35 year wait for a British winner in the top flight class of motorcycle racing with a stunning victory in Brno this afternoon. A savvy switch to the harder option wet Michelin tyres, both front and rear, saw Crutchlow plummet well outside the top ten in the opening stages, but it proved to the right call as the harder rubber came into its own after a handful of laps with Crutchlow carving through the field almost two seconds faster than the Ducatis of Andrea Iannone and Scott Redding out front. Only Valentino Rossi was able to run a pace similar to Crutchlow having also taken the gamble on the harder rear tyre, but leaving it later than Crutchlow to initiate his charge, it was too little too late for the Italian who had nothing left for the Brit in the closing stages. The soft wet tyres of early leaders Iannone, Redding and Dovizioso were obliterated come the end of the race, with only Marc Marquez able to remain somewhere close to the front on the softer option rubber to take an important third place. Loris Baz equalled his career best result in fourth, getting the better of team-mate Hector Barbera, who had run in third for most of the race, in the closing stages of the race. Eugene Laverty took an impressive sixth ahead of Danilo Petrucci, with long-time race leader Iannone limping across the line in eighth after his tyre issues. 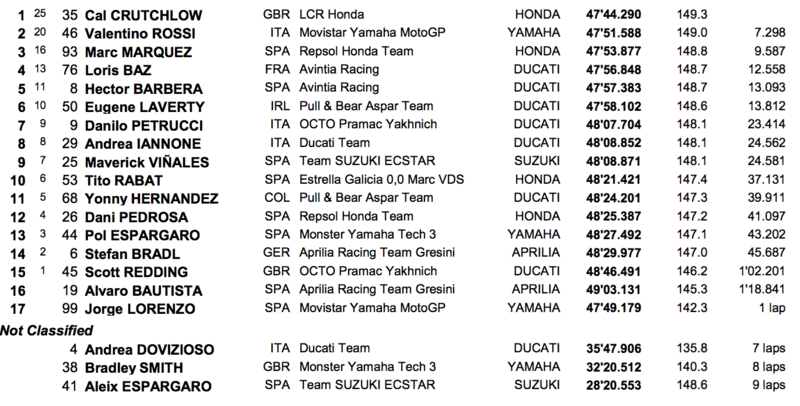 Maverick Vinales and Tito Rabat rounded out the top ten. It was an awful race for Jorge Lorenzo, who again struggled to get to grips with the wet conditions as quick as other riders, but once he had started to lap at a similar pace to team-mate Valentino Rossi he made a bizarre decision to enter the pits to switch to his slick-shod M1 despite his team’s best efforts to keep him on the wet set-up machine. A few laps later, Lorenzo returned to the pits to switch bikes again, ruling out any chance of a points finish for the three time World Champion meaning he’d hand series leader Marquez another 16 vital points. 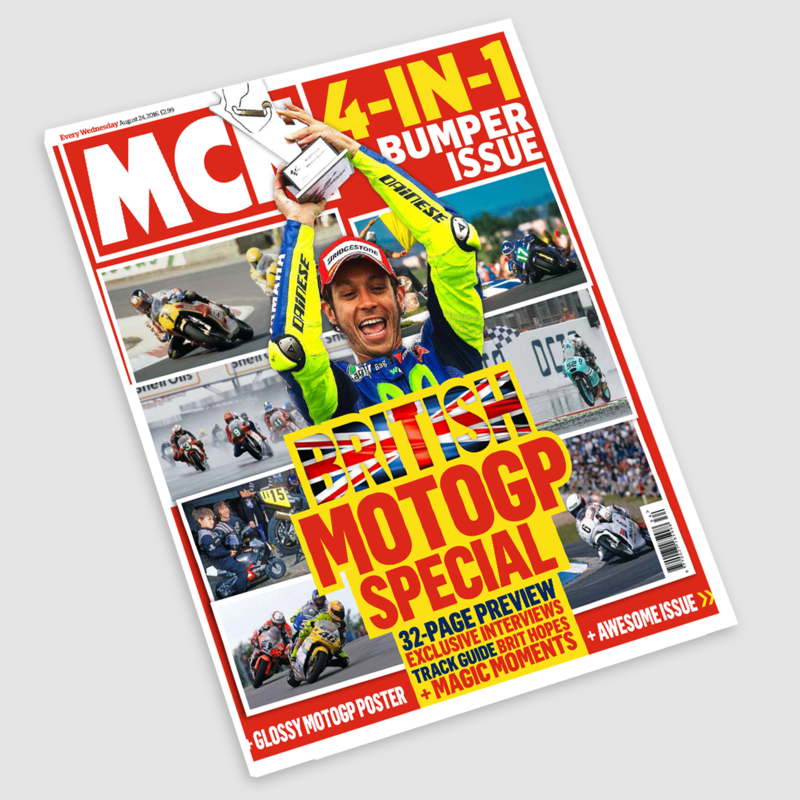 Crutchlow’s victory marks the first time a British rider has won a race in the premier class of Grand Prix motorcycling since the legendary Barry Sheene in 1981. Poll: Now Cal has won Brno, will he win Silverstone?